Crop diversity is essential for life on earth. It is at the basis of our food and nutrition security. The Global Crop Diversity Trust ensures the conservation and availability of crop diversity. Oxfam Novib complementarily strengthens smallholder farmers in their rights to access and benefit from our planet’s variety of plant genetic resources. The Global Crop Diversity Trust and Oxfam Novib are convinced that by active collaboration their impact can be increased. 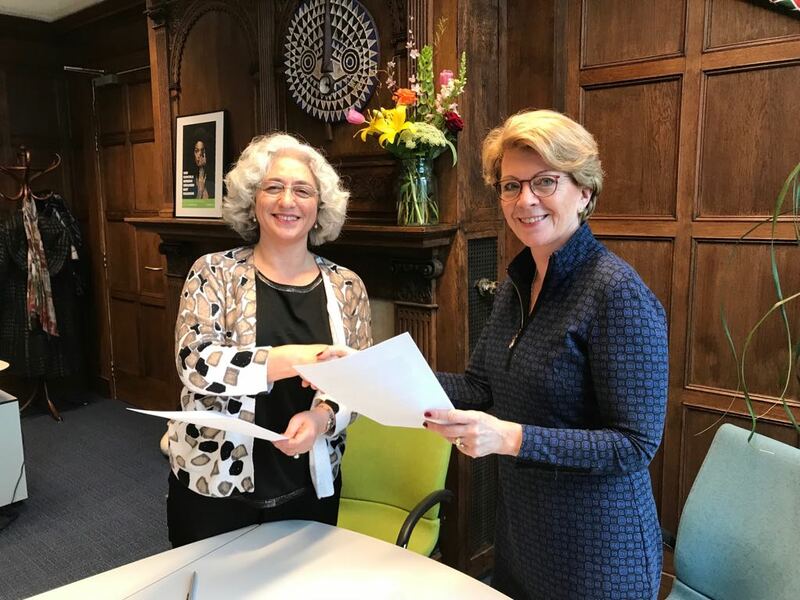 On January 25, Marie Haga (executive director of the Global Crop Diversity Trust) and Farah Karimi (executive director of Oxfam Novib) signed the intention to collaborate on current and future programs as well as to develop joint programs on climate change resilience and crop diversity in smallholder systems. Despite its importance to food security, much of the world’s crop diversity is neither safely conserved, nor readily available to scientists and farmers. Farmers are the (traditional) managers and protectors of biodiversity and they rely on it to safeguard their agricultural productivity. Especially in areas that are affected by climate change, access to biodiverse plant genetic material can be lifesaving. Farmers can sow a higher variety of seeds to reduce the risk of losing their harvest and develop varieties that are more resilient to their local circumstances. The Global Crop Diversity Trust supports collections of plant genetic resources in genebanks. These collections together make up for around 800.000 samples of landraces and wild species, containing a vast array of traits and characteristics. The Global Crop Diversity Trust wishes to further promote the use of these collections. SD=HS Farmer Field Schools, farmers’ capacity to adapt crops to their own needs in highly diverse environmental and socio-economic conditions is strengthened. By establishing a collaboration between Oxfam Novib and the Global Crop Diversity Trust, both organizations aim to contribute with greater impact to the United Nations Sustainable Development Goal (SDG) Target 2.5. It states: “By 2020, maintain the genetic diversity of seeds, cultivated plants and farmed and domesticated animals and their related wild species, including through soundly managed and diversified seed and plant banks at the national, regional and international levels, and promote access to and fair and equitable sharing of benefits arising from the utilization of genetic resources and associated traditional knowledge, as internationally agreed”.